I have four very different books to tell you about. Very, very, very different. From each other, that is. And, from the rest of the market, too. First, a book by Swedish food enthusiast (and blogger!) Lisa Förare Winbladh. 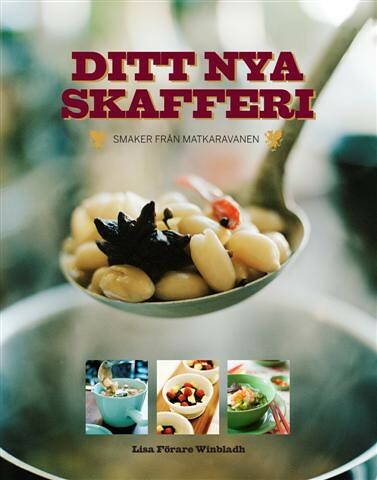 It's called Ditt Nya Skafferi (="Your new cupboard")and it's published by Damm. This is a truly beautiful book for those who love food, but it's not for the faint of heart. It contains tons of ingredients you've never heard of before (well, at least new to me! ), and wonderful southeast asian-inspired recipes. And, what makes this truly different is Lisa's insightful advice and knowledge about all of this. She searches for the genuinely best, and gives you advice on what dates to use and why, what goji berries really are and why you should use them, and that dried shrimps can be kept in the freezer, to keep the scary smell away until you want to use them. I was lucky enough to be invited to the release party, and thus lucky enough to taste some of the wonderful food. Well, I was also a recipe tester (albeit a not very good one, as I have a hard time sticking to a recipe without making modifications!) and have posted pictures of some of the food that I've made here here and here. So what's the first thing I'll make? Well, I think it'll have to be Bak Kut Te - a brothy, spicy, warming soup. And for dessert, brownies with orange blossom water and pistachios! Enough with the books in Swedish, please! Yes, I know - many of you don't speak Swedish and are not so interested in the Swedish cookbook scene. Sorry. Well, this one is for you then! It's called The New Art of Japanese Cooking by Chef Masaharu Morimoto (published by Dorling Kindersley). Japanese food? Ah, sushi? And tempura? That's it, right? No. It's not. It's so much more. And this book really showcases that. It's playful, it's inspiring and it's fun. And it's, I'm sure, delicious. Me, I'm dying to make gyozas with bacon-cream reduction. How tasty is that?! Or frozen lettuce with a caesar salad dressing?! Well, it's something I've definitely not thought about before, and that's why this book is so interesting. Chef Morimoto is well known as a celebrity chef, as he is Japanese Iron Chef on Iron Chef America. And he has restaurants all over the world. And now, a cookbook. That you should have, if you're at all interested in Japanese food, or at least in modern, playful cooking. Not feeling up to all that complicated cooking? Well, that's ok. 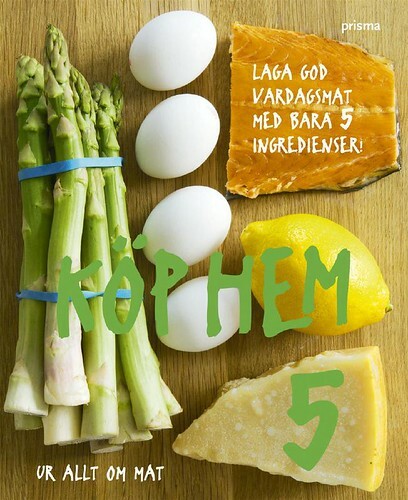 This little book is called Köp Hem Fem (="Buy Five") and it's a book from Allt Om Mat which is also one of Sweden's largest food magazines. (Published by Prisma.) Each and every recipe here contains no more than five ingredients (apart from certain cupboard staples) and everything is easy to find in your local supermarket. No need for specialty shopping here! This book is certainly not a great read, like the others I've mentioned. It's nothing to leisurely leaf through and dream about all the food - but it's practical, and that's nice too. It has fast, simple every day recipes and that can be very good when you're not particularly inspired to "play in the kitchen" and just want something good to eat. I also really appriciate that Allt Om Mat has a test kitchen, and really works through each and every recipe to make sure it can be replicated at home. That's good, because it means you can be confident about cooking. I'd say that this is the perfect book if you want to venture into more cooking, and adding a few easy dishes to your repertoire. Finally, a book that I've mentioned briefly. It's written by my friend Kinna Jonsson and her mother, and the graphic design is made by Kinna's sister. The recipes are from five generations of women in their family, and I love that this is a real family project. But more than that, I love that it's a great book. It has all kinds of bread, cookies and cakes - each one sounding more delicious than the next! I haven't baked from it yet, but I've tasted some of the goodies from it and they're all super. So - this book is the perfect christmas present for someone who enjoys baking, and who's excited about traditional Swedish recipes. You can order it here, or find it in select bookstores. Once you've made tonkatsu (fried boneless pork chop (japanese comfort food) you don't look back at how you made it before. And I had been making it another way for ten years. Once you've made it Lisas way I meant. I'm still bummed I didn't buy "Längtans Mat" when I was home this summer. Could even have bought it in English! Beautiful. I will check out the five generations book, though. The same idea struck me when I visited my folks during the summer and I browsed through Mom's recipes. So many things I grew up with and, honestly, I don't know how to make them or where they came from. I shouldn't let that knowledge be forgotten. Chef Morimoto's first restaurant of his own was here in Philadelphia, PA (in the US) and the food is just so wonderful. Hugely expensive and worth every penny (or öre ;)). 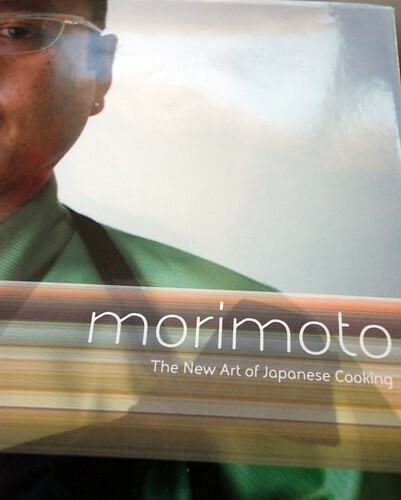 http://www.morimotorestaurant.com/ has lovely photos of some of the food, as well as the menus. I love looking at food photos...how funny. I'm always looking for recipes that have just a few ingredients but still taste good! I mormors berså is truly amazing! I love books that tells a "story".